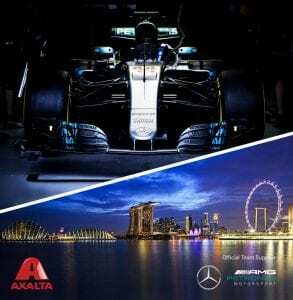 Under the lights of the Singapore Marina Bay Street Circuit, the two Silver Arrows of Mercedes-AMG Petronas Motorsport shone and gleamed for 61 laps, as they fought a great 2017 Formula One Singapore Airlines Singapore Grand Prix. The race saw Lewis Hamilton win his third consecutive race of the 2017 season, which extends his lead in the FIA Formula One World Drivers’ Championship and the team’s lead in the FIA Formula One World Constructors’ Championship. Axalta Coating Systems, a leading global supplier of liquid and powder coatings, is Official Team Supplier to Mercedes-AMG Petronas Motorsport. 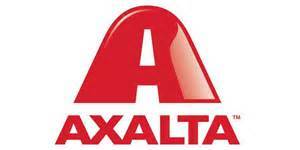 Axalta’s premium refinish coatings, have been responsible for the paint on the high-impact, instantly-recognisable liveries of the team’s race cars for the past three years, including the cars of their three-time World Constructors’ Champions success. For Axalta, the relationship with Mercedes-AMG Petronas Motorsport is key to its decades-long strategic global partnership with motorsports. Formula One in particular, as the leading global racing discipline, allows Axalta to demonstrate the extent of the coatings’ technology and durability in high endurance, exceedingly demanding racing environments. The 2017 Silver Arrows livery comprises 13 colours, none of which are commercially available: five shades of green, three shades of blue, four shades of graphite silver and the main colour Stirling Silver, named after Sir Stirling Moss who drove for Mercedes in 1955. During the season, the team paints thousands of panels and components, as many as 150 in some weeks, so when speed and accuracy of application are required the team relies on Spies Hecker to deliver.